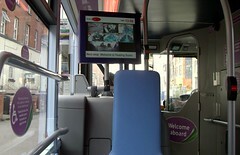 Watch people on CCTV cameras, LIVE, on the number 17 bus! Distributed social responsibility by having lots of witnesses to any naughtiness on the buses. Everyone knows they are being watched. Reading bus services are cutting edge, except perhaps for the requirement to pay to ride. Using cash and having the exact change. How archaic is that? Why can’t I just have my retina scanned by one of these many inplace cameras and have the money directly deducted from the bank account of my choice? A Visitor is a construct designed to come as close as possible to defining the number of actual, distinct people who visited a website. There is of course no way to know if two people are sharing a computer from the website’s perspective, but a good visitor-tracking system can come close to the actual number. The most accurate visitor-tracking systems generally employ cookies to maintain tallies of distinct visitors. 600-ish visitors were sent by search engines. 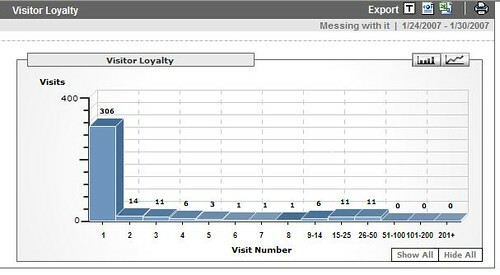 60-ish visitors return* several times per month. Many friends and family are in this group. 10-ish visitors, and me, return twice a day. Given that I regularly post only once per day 2 visits is a tad perplexing. no-one visits between 101-200 times per calendar month, how odd is that? As odd as a snake wearing a beanie in a wheelbarrow race, that’s how odd. *return = becomes active after more than 30 minutes inactivity in the Wendy House. 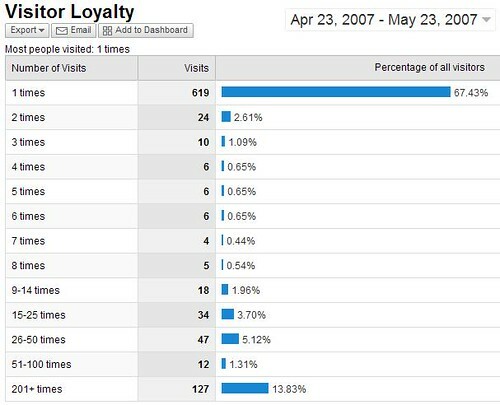 In this second post of a sporadic series on blog quality I hypothesize a classification of current blog visitors using some of the Google Analytics statistics for :: The Wendy House:: This is my first step in developing an intended user ‘Persona’, Alan Cooper style, that will be used to improve your experience. Hoorah! 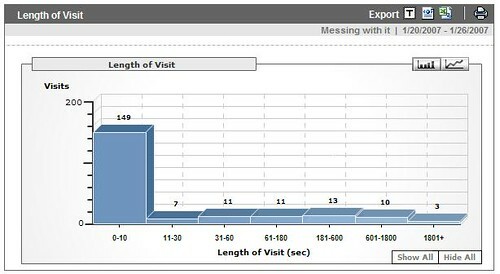 Pat promptly leaves: 149 visits are less than 10 seconds. Sam the speedy scanner: 18 visitors stayed between 10 seconds and one minute. Charlie checks content: 24 people stayed between 1 and 10 minutes. I suspect these people acutally read enough of the Blog to make a reasonably well informed estimation about the relevance of its content to them. *one person can appear in these statistics more than once, by re-visiting. Approximately 10% of the total site visits are return visits. Google analytcis provides a web site statistics service that is free to websites that receive less than an obscenely large amount of clicks. I set it up for the Wendy house and dropped by to look at the reports 24 hours later. I bet you can’t wait to find out ‘what are the top twenty search phrases‘ that bought new seekers to this site. These people were here, with you! “Distinct hosts” (computers?) “served in the last 7 days” – 262. If we guess that my 7 friends use 3 computers in a week that still leaves 241 computers. Maybe 1/3rd, 80 of those are searchers and 80 are blog-summarising computers. That still leaves about 80 computers with strangers-to-me accessing this blog. “Successful requests for pages in last 7 days” – 2,859. That’s an average of approximately 408 per day. If we deduct the 200 times per day that I read my blog that still leaves 208 page loads. If my 7 friends read my blog once per day that still leaves 201 page load unaccounted for… …wow, for me that’s BIG! 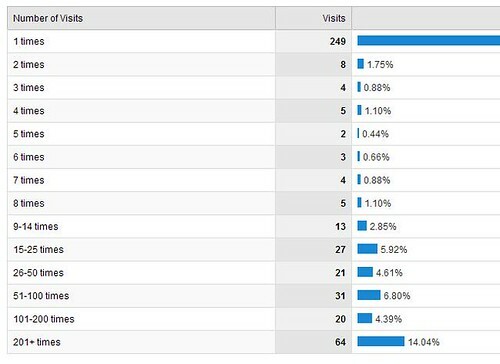 I have no idea how blog readers influence this statistic. I’m confident they do.